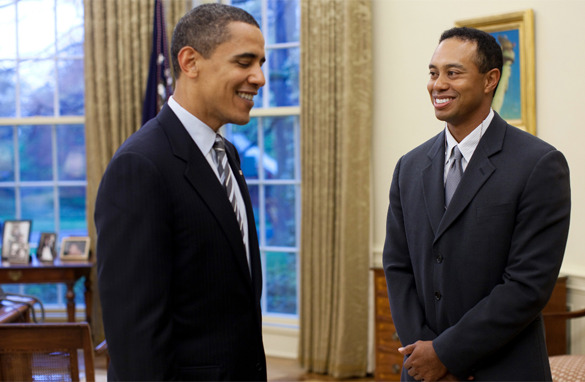 The president agreed to meet with Woods after learning the golfer was in town to promote his upcoming charity tournament in the Washington area, according to White House Press Secretary Robert Gibbs. Here you have two men, of the same color, experiencing the epitome of their dreams, now a reality, as both of these men are now at the heights of their careers. Interestingly enough, this poses one question? If you could be either of these men, who would you like to be. The guy on the left has the ultimate responsibility of keeping the world safe and has to deal with all the problems associated with the Presidency. The guy on the right, just has to play the game of golf, but has a high responsibility to his followers of the game of golf. Both are driven by their passion and desire to succeed.